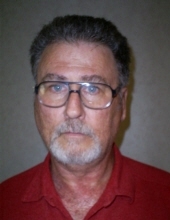 Willard Brandon George, 60, of Big Point, MS, passed away on Wednesday, March 20, 2019 at his home in Big Point. Brandon was born on November 30, 1958 in Moss Point, MS to Clinton Otis George and the late Bettie Dean George. He worked as a horseshoer most of his life and was a true cowboy. He loved the bonds and relationships he made with his many customers through the years. He had a passion for bluegrass music and enjoyed playing a variety of instruments. In addition to his mother, Brandon was preceded in death by his infant son, William Otis George. He leaves to cherish his memory his loving wife of 27 years, Karen George; children, James Patrick Barron and Lily Diane (Ryan) Parker; granddaughters, Audrey and Juniper Parker; father, Clinton Otis George; brother, Tracy (Peggy) George; several nieces, nephews, other family members, and lots of friends. A Celebration of Life service will be held on Tuesday, March 26, 2019 beginning at 6:00 p.m. at Trinity Methodist Church in Escatawpa with Bro. Perry Smith officiating. To send flowers or a remembrance gift to the family of Willard Brandon George, please visit our Tribute Store. "Email Address" would like to share the life celebration of Willard Brandon George. Click on the "link" to go to share a favorite memory or leave a condolence message for the family.